The first contract for the delivery of Su-34 combat planes was signed with the Russian Defense Ministry in 2008. Four years later, the advanced fighter-bomber entered service with Russia’s Aerospace Force. As Commander-in-Chief of Russia’s Aerospace Force Viktor Bondarev said earlier, the Su-34 will eventually replace Su-24 (Fencer) frontline bombers and Su-25 (Frogfoot) attack aircraft. The Russian Aerospace Force is expected to receive no less than 200 Su-34 fighter-bombers under the state armament program through 2020. The aircraft features a standard aerodynamic layout with an additional foreplane, a trapezoidal mid-wing, twin vertical tails, two AL-31F engines in the fuselage rear and tricycle landing gear. “And, by the way, it is pure truth that the advanced fighter-bomber is gently called the ‘Duckling’ in the troops due to its flat-shaped nose cone. I don’t see anything bad in this,” said Capt. Alexei Belonog. “The Su-34 is a unique machine. It incorporates as many as three planes: a fighter jet, an attack aircraft and a frontline bomber. The Su-34 can successfully fight any aerial objectives and effectively destroy ground and surface targets. Moreover, it can stay endlessly long in the air and this duration can only be limited by pilots’ physical ability,” said Viktor Litovkin, a TASS military observer. “Even before the plane entered service, a crew of test pilots from the Sukhoi design bureau performed a non-stop flight from Moscow to Sakhalin in the Russian Far East and back with aerial refueling, thus proving to all those in doubt that the fighter is capable of accomplishing any missions at the farthest distance from its home airfield,” said Viktor Litovkin. “There is a microwave oven, an air conditioner, an electromassage system built into the pilots’ seats and even a bio toilet aboard the bomber. If you get to know that such arrangement can’t be found aboard not only fighter jets but also long-range bombers and even Ilyushin Il-76 military-transport planes, then you can only be surprised once again at the uniqueness of the Su-34,” Viktor Litovkin noted. The Su-34 is armed with a 30mm gun and its 12 hard points can carry various types of air-to-air and air-to-surface aircraft-launched missiles, rockets and air bombs. “No doubt, the interest has increased. I want to say that dozens of [state arms exporter] Rosoboronexport’s delegations are on foreign trips every week and there is a very intensive process of negotiations with countries of the Middle East, Africa, Latin America, Asia and so forth,” said Sergei Goreslavsky Rosoboronexport deputy CEO. “The Algerian side has long expressed its desire to buy Su-34 planes but there was no export configuration certificate for this machine before. Now it is available. I believe the contract will surely be signed in mid-2016 or before the end of the year,” said a source in the defense industry. 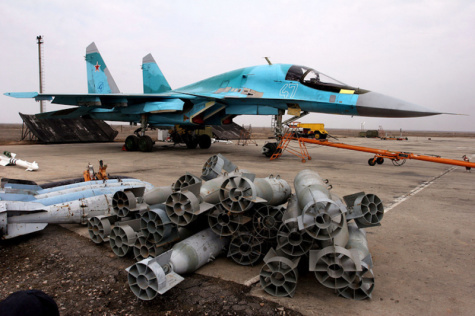 The Su-34 fighter-bomber can carry up to six R-73 missiles in launchers placed at the aircraft’s wingtips or under the wings and up to eight R-27 missiles that can be mounted on ejector racks or launchers both under the wing and on under-fuselage hard points.